People participate in a gun-rights rally at the Capitol, April 14, 2018, in Indianapolis. The rally came less than three weeks after hundreds of thousands marched in Washington, New York and elsewhere to demand tougher gun laws after the February school shooting in Parkland, Florida, that killed 17. Gun rights supporters gathered in Atlanta and dozens of other U.S. state capitals Saturday at a time when many Americans are pressing for tougher restrictions on weapons. According to a early Associated Press count, more than 135 people attended the rally in Atlanta, and more were arriving. Most of them were armed, and some held signs as they listened to speeches. A few people wearing "Black Lives Matter'' T-shirts made videos but didn't interact with the ralliers. Joe Dobbins of Hartford, Maine, wears a cutout of an rifle while attending a gun rights rally, April 14, 2018, at the State House in Augusta, Maine. In all, a group called the National Constitutional Coalition of Patriotic Americans said organizers had permits for gatherings in 45 states. 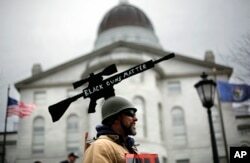 They encouraged supporters to bring unloaded rifles in states where it's legal. 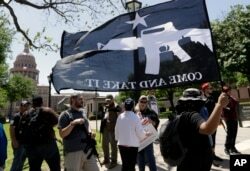 A man holds a "Come and Take It" flag during a pro gun-rights rally at the Capitol, April 14, 2018, in Austin, Texas. Gun rights supporters rallied across the United States to counter a recent wave of student-led protests against gun violence. The rallies came less than three weeks after hundreds of thousands marched in Washington, New York and elsewhere to demand tougher gun laws after the February school shooting in Parkland, Florida, that killed 17. Daniyel Baron helped organize the Delaware rally. The former Marine said he feared the current gun-restriction efforts were a precursor to eventual prohibition of all gun ownership.